Nokia is one of the two most successful players in the fashion segment these days, sharing the title of a leader with Samsung. The koreans currently succeed by dint of the "display plus polyphony" combo, the quality of materials and assembly, as well as specific, fairly conservative, but always high-quality (that is universal, accepted by mass users) design. Nokia acts like a trendsetter, it bravely experiments with the form, color, and material. Its trumps are the pioneer style and the more famous brand. So, new fashionable models from Nokia practically always attract customers. Nokia has recently presented an entire series of interesting models in the fashion sector. One of them is Nokia 7270, the third clamshell phone in the history of Nokia. Based on the Nokia Series 40 platform of the latest revision, it demonstrates functional traditionalism as well as several interesting features, which are not typical of products from this company. 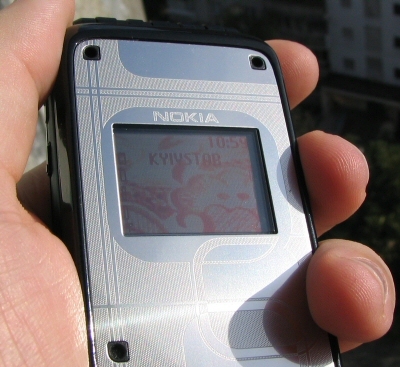 Nokia 7270 is a clamshell phone with the dimensions slightly above average for our times. It's a tad smaller than such popular models as Nokia 7200 or Motorola v300/v500, but larger than the fashionable unisex Samsung E700, P510. The closest analog to 7270 in terms of dimensions and weight will be Motorola v600. Nokia tried to resolve its new fashion model in unisex style as well, however the unusual appearance will not satisfy classic style fans, being a majority among pragmatic men. This is a model for expressive people trying to stand out against a background, its price and design allowing, at least at the initial sales stage, to position Nokia 7270 as an elite phone for a fashion bash. Both men and women may purchase phones with such characteristics and by this principle, but the female audience prevails, comprising over 60% of all customers of this model. This target group will be most likely pleased by the form of the phone, silver decorative pattern panels, and the salt of the phone – additional snap-on wraps. 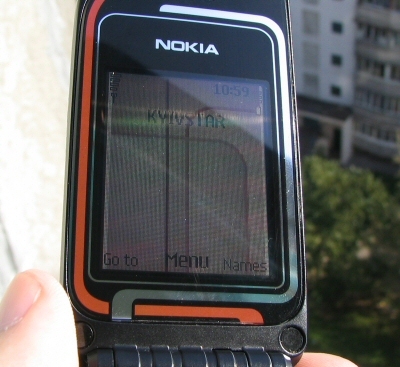 Geometric solution of 7270 includes an asymmetric form with one rounded corner, selected by Nokia for the new series of phones (its S-shaped modification featured in 7600 and 7610 models). The phone is almost rectangular in section, with slightly rounded corners. Three moments draw our attention. The front and the rear phone panels are metallic, with a pattern photoetched on them. You can feel the relief by touch. The construction allows to install decorative panels, providing mounting holes at the corners for panel pins. And at last, the phone hinge is of an unusual construction – it consists of several sections of various widths. The relief on the hinge parts imitates many hinge sections of the same width, but it's only how it looks. In fact there are only three hinge sections on the base block and two hinge sections on the top flip. But this construction is quite justified. The point is that the softer plastic than in Samsung cases provides a tight hinge construction without backlash and the top flip can be fixed tightly in any positions. The case is made of high quality plastic with semiglossy surface. The material is good but soft, a good idea of the hinge construction made this unit quite strong, but it does not prevent slight creaks of the seams when the phone is grasped hard. However, this is not much of a problem and it does not spoil the overall impression. Surface finishing is of high quality as well as the assemblage, though Samsung surpasses Nokia in this respect. Nokia 7270 keypad is typical of models based on the latest revisions of the Series 40 platform. It's a standard digital unit, the Call and End keys with the corresponding soft keys are united into swing buttons, as well as the four-way directional joystick with the OK button in the middle. The keys are rather large, which allows comfortable operations with the keypad without false key presses. There are only some complaints about the control keys: the swing buttons are too small, and the OK button is not that distinguishable. However, the inconveniences are not that great. The keypad almost lacks the relief, that is it's designed to operate by sight. You cannot confidently press the keys by touch. However, fashion mongers do not need that. Other control elements include a couple of keys on the left side of the base block to control the volume, the PTT button and the Off button on the right side; the IR-port window is also there, and the Pop-Port connector is located on the bottom. The keys slightly project over the surface of the case, so they are moderately comfortable to use. And the Off button is buried into the surface, it's not very tight, better than in most Nokia models. The front panel of the top flip, almost near the bottom edge, hosts the lens of the built-in camera, its protective glass is joint flush with the metal panel — it won't get away without scratches, but it's easy to sponge. 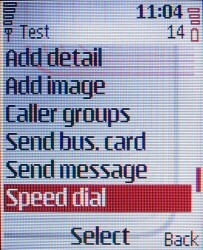 The main display in Nokia 7270 has really pleased us – it's a 128x160 transflective TFT display supporting 65 536 colors. At last a phone based on Nokia Series 40 has a good display, which can compete with displays from other top models. The image, as in other Nokia TFT displays, is characterized by average contrast, brightness, and saturation. The gaps between pixels are also rather wide, which means noticeably grainy image structure. Transflective properties make the display easy to read even under direct sunlight. 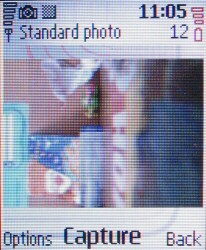 So, this display is rather average in its image quality, but the fact itself of a large-area display in Nokia 7270 is a good thing. 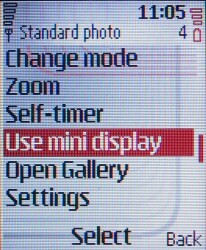 The external display in Nokia 7270 has a resolution of 96x65 pixels being capable of displaying 4096 colors. It's one of the largest external displays in modern clamshells, except for some Alcatel, Pantech and other models – mostly not very popular. Note that the display reads well at direct sunlight, which is very important. The handset is equipped with a standard lithium-ion Nokia BL-4C battery, the battery retention is traditionally very simple, it's fixed in the bay without special latches. The slot for a SIM card is under the battery, it's equipped with a flap tin-plate of the complex section latched to the right side of the battery bay. The battery cover is fixed by the lugs on the bottom end and a button-latch on top. The latch is rather hard, but it is not much of a problem. The construction is free from backlashes, it does not squeak. As we have already mentioned, Nokia 7270 is based on the latest revision of the Nokia Series 40 platform. 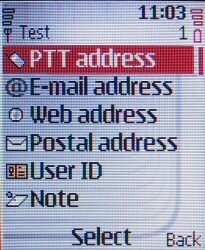 It means that besides the standard functions, it supports PTT, Presence-services, and it has a built-in IM-client. The menu is traditional for Series 40, but preset themes were designed specially for this model. Users can select one of several available themes, which are all styled in accord with the look of the entire handset. The handset is equipped with an advanced addressbook, which can store up to 5 phone numbers (general, home, work, mobile, and fax) and 4 text fields (e-mail, URL, e-mail address, and notes) for every contact. You can additionally specify PTT and instant messaging IDs for every contact as well. Records from the built-in addressbook and SIM-card memory are displayed in the same list, though if you wish you may list records only from one source. 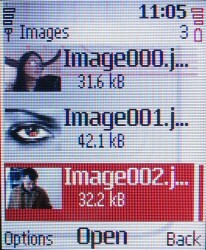 Contacts also can be divided into five preset groups. The phone supports the voice dial function, including phone numbers stored in SIM-card memory (which is quite a rare thing), you can also assign a photo or an image to any contact, which will pop up at an incoming call. Besides, you can request the Presence-status of the contact from the addressbook. 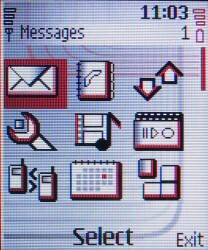 The Messages menu comprises options concerning managing SMS, MMS and e-mail. The handset also has a preinstalled instant messaging program. In all the rest its message functions are typical of handset models based on Series 40. The Call register menu lists dialled, received, and missed calls, as well as call durations and costs, traffic volume and GPRS connection times. The Settings menu contains settings for multiple handset parameters. Here you can select profiles, ringtones, menu themes, both display parameters, date and time, configure "hot" keys, enable IrDA and GPRS (the latter is not quite right actually, because when settings for one function are scattered in different places, it usually results in problems). The same menu is responsible for network functions control. Redirection of calls is placed together with call options and automatic volume control (nontrivial function, by the way), which may confuse any user. The menu also contains phone setup (auto key lock, unlock password, menu language, help windows, etc), security options and accessory settings (including some charge options, lacking in other phones). 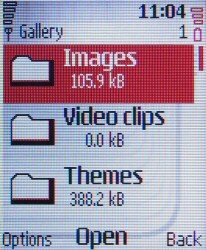 Gallery – media browser traditional for Series 40 and implemented as a file manager, which allows to browse images, photo, video, ringtones, digital music, and voice memos stored in phone memory. 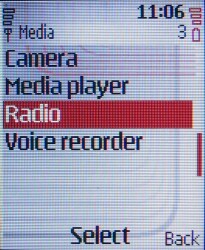 The next option in the main menu is Media – here you can control the camera, media player, dictating mac, and radio set. The maximum resolution of the built-in camera is 640x480 pixels, it supports recording video with sound. The quality in both cases is typical of Nokia products. The phone has enhanced shooting settings and options, now it reaches the best camera phones in camera control flexibility – Samsung models in particular. 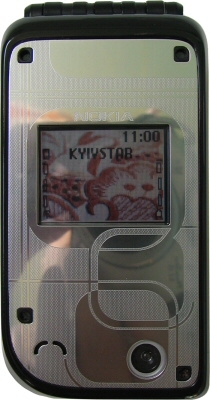 Media player allows to play back music stored in phone memory as well as to listen to streaming audio, which support has been added to Nokia 7270. The dictating mac allows to record voice memos of 3 min each, including phone calls where it records voices of both speakers. A separate menu is devoted to Push-to-Talk – here you can configure parameters of the service itself, its contact list, browse the callback list, and configure other options. Organizer contains a standard set of applets, but some of them have been enhanced. 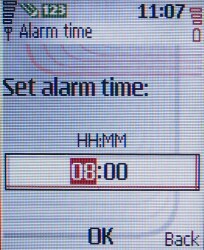 The alarm clock can be programmed for one signal: one-off type or repetitive basis. 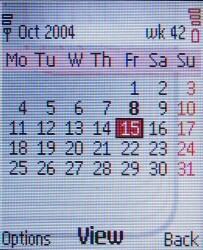 In the latter case you can select which week days it will work (as in Siemens phones). Calendar-organiser offers monthly and weekly views and allows to program reminders of several types. Besides, the phone has a to-do list, calculator, countdown, stopwatch, notes, electronic Wallet, and SyncML control. The Applications menu provides access to Java-midlets. They are divided into folders in Nokia 7270: one folder contains games, the other – utilities. We cannot say that the set of applications is final, because we had a test sample, and the list of preinstalled Java-programs always varies depending on firmware versions and localization. In our sample we had a dancing arcade (Disco) and a flipper simulator (Chic Pinball). What concerns business applications, we had a converter of sizes for clothes and shoes (it's an important application for fashion mongers) as well as a simple 5-language dictionary of English, German, French, Spanish, and Italian. And at last, a WAP browser is traditionally located in the Web menu. Nokia 7270 has a little over 2.2 MB of memory. For these days it's not much, but if you take into account that the target audience of this handset does not actively use "heavy" functions, RAM capacity can be actually considered satisfactory. Nokia 7270 provides normal reception quality. The speaker volume is rather high, it's quite enough in most cases, the audio quality is good. The battery life is about 4-5 days with 10-15 minutes of calls every day and active menu exploration. It's a good figure for a clamshell phone. 24-chord polyphonic ringtones sound very loud, so that it can be potentially heard in any environment. But there are two problems. Firstly, preinstalled ringtones are basically of modern genres and thus notable for impure sound (mostly percussions), so they are most easily muffled by the street noise. Secondly, a 24-chord synthesizer is still not enough for a good arrangement. The vibra alert is evidently bad: it's notable for small vibration amplitude. But the problem is rather that the vibrations are mostly felt at the sides instead of the front and the rear. Considering that it's these surfaces that touch the body when you carry the phone in a pocket, we can state the generally low level of the vibra perceptibility. From the technical point of view Nokia 7270 is quite a successful product and it demonstrates noticeable progress in comparison with previous clamshell phones from this company. Of course, you can compare this phone directly only with Nokia 7200, because they are products of the same class. The new phone is better due to a larger display, louder polyphonic ringtones, better quality of the materials and housing, as well as professionally engineered construction, which provides the lack of backlashes and squeaks and firm fixation of the phone in opened and closed positions. Nokia 7270 is also better than 7200 by its fashion characteristics – it's smaller, metallic covers look more imposing, expensive, and solid than the plastic ones in 7200. Fans of textile wraps can use them with this phone as well, but the phone looks OK even without them, it provides even more freedom in customizing its appearance. We've got a good subjective impression of Nokia 7270. The phone is reasonably extravagant, and what is more important – its build quality is high. Besides, it is stuffed with a rich set of modern functions, which most fashion models cannot boast of. The phone does not have critical drawbacks, the most annoying issue being a weak vibra alert. The other minor shortcomings are quite pardonable. Nokia 7270 enters the market at an interesting moment — after Samsung assaulted the fashion segment and filled it with its models and, from the one hand, the Samsung brand was at last as accepted by the elite audience as Nokia, on the other hand, one can see the predominance of models from this manufacturer, they are in plenty, they already lost its exclusive nature, and the fashion audience starts to search what can arouse its interest except Samsung. Nokia has strong positions here, because its brand is of high account. Nokia acts in several directions — it manufactures loud, brave and somewhat unexpected products, unlike more successive, discreet Samsung designs, and it competently advertises its products. The finnish company also significantly outscores the koreans in functionality, its products supporting advanced services and having better business functionality. They only lack either a new idea for fashion mongers of how to use these functions, or unique Nokia functions demanded by customers. It's highly probable that the role of the latter will be played by getting rapidly popular PTT service, which is not yet supported in korean phones. But even without it, Nokia 7270 is an excellent product, which is bound to become a fashion hit in case of a competent advertising campaign.